Warren Buffett makes a good case regarding gold. This seems like a pretty reasonable argument. However, gold has been one of the most enduring investment options. As far back as 3500 BC, Egyptians were using gold for ornaments, statues and money. There are plenty of investment experts who recommend some long-term strategic allocation to gold. If gold is such a bad investment why do people do it? In our opinion, gold is not an asset, it is a currency. A currency has no intrinsic value, it is just a method for easy exchange of products and services. No matter how much care and attention you give gold, it will never pay you a dividend or grow bigger. The only way you will make money from an investment in gold is if you sell it to someone else at a higher price than you bought it for. That is speculation, not investment. This appears to stack up with historical evidence. 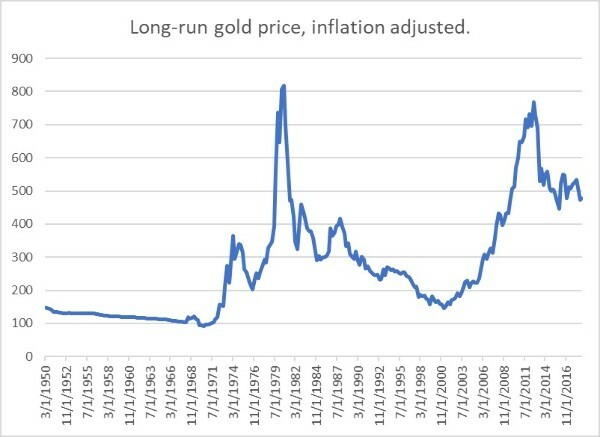 The chart below shows the long-run price of gold in US dollars adjusted for inflation. While there have been periods of fantastic returns, the accumulation of wealth from holding a long-term position in gold has been poor, only 1.7% per year if you had invested in the 1950's. And for that you would have suffered some tremendous volatility. If you were the unfortunate buyer of gold at its peak in September 2012, your real return in USD would currently be -38%. If you were an even more unfortunate buyer of gold at its peak in September 1980, you would still be waiting to make a positive real return. However, gold does have great attributes as a currency. It is inert, dense, soft, malleable and ductile. Gold does not rust or age, and, most importantly it is scarce and free from government manipulation. Over a long time, gold has been the safest and most enduring currency. Gold does have a new, young suiter trying to topple it off its currency perch. Bitcoin appears to rival gold's currency attributes. It is a bit like a virtual version of gold, but better. It is scarce, even easier to transport, and more divisible. However, Bitcoin isn't the only cryptocurrency available. 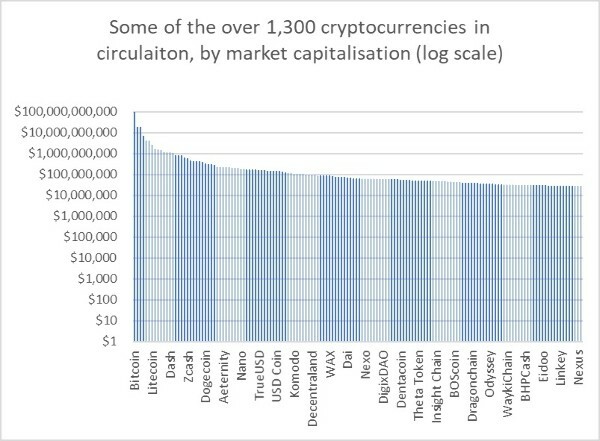 While Bitcoin might be scarce, the potential amount of cryptocurrency is infinite and is currently growing rapidly. Each new version of cryptocurrency is a different flavour of Bitcoin. It is like people were discovering slightly goldier versions of gold every few months. This must debase the perception of Bitcoin's value. Also, you can't turn it into a ring and put it on your finger if it ceases to be useful as a currency. Cryptocurrency is most definitely here to stay in some form, and probably is having some effect on the price of gold, but gold retains some uniquely valuable attributes as a currency. In a world where reserve currencies are being debased by quantitative easing, financial instability is high, and political instability is increasing, the attributes of gold as a secure, short-term holder of wealth appear to be increasingly positive. Crispin Odey of Odey Asset Management has also noted that gold has become substantially scarcer relative to other currencies since the beginning of this millennium, central banks having printed over $80 trillion of money, backed by only $1.27 trillion of gold. Even Warren Buffett concedes that gold is generally a good fear trade. If you fear inflation due to increased money supply, gold should hold up in real terms and be a good hedge. If you fear political turmoil, gold is a good place to hide funds from shaky governments. But this is a speculative trade. Not only do you need to form a view on the future, you also need to assess whether your view is more positive or negative than the market. So, is it time to invest in gold? In our opinion, barring the meltdown of modern civilization, the time to invest in gold is never. An investment in gold is purely speculative and has no place as a long-term investment. In times of political or financial turmoil it might turn out to be a good place to store wealth in the short-term, but it is unlikely to be a good generator of long-term wealth.